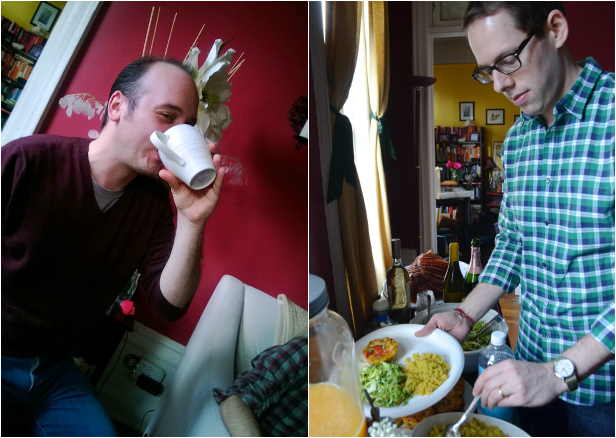 This past weekend, I invited a few of my favorite people over for a cozy winter brunch at home. 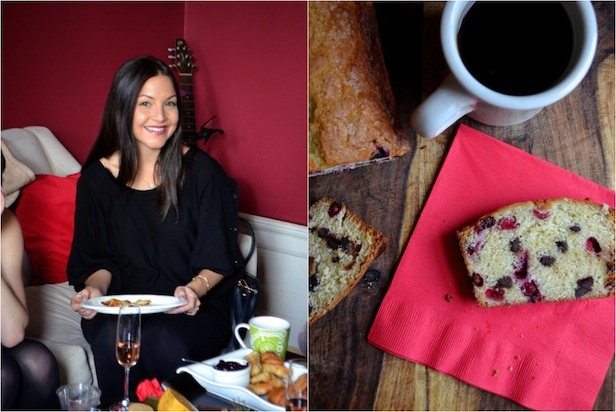 It was cold, but sunny, and felt like the perfect day to spend a few hours sipping coffee and feasting on a bevy of sweet and savory dishes. 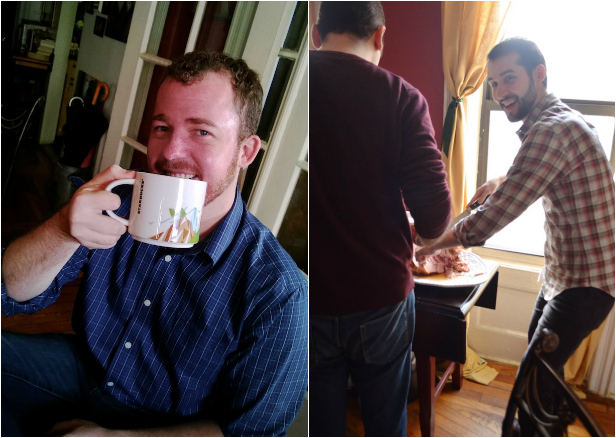 I've been collaborating with Starbucks this month to share how their Starbucks K-Cup packs make entertaining guests easier, so it was also the perfect opportunity to share the new Starbucks® Vanilla K-Cup® Packs and Starbucks® Caramel K-Cup® Packs with my friends. 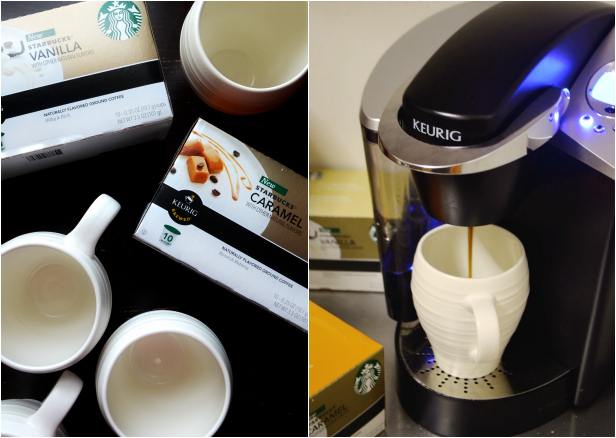 I seriously love that I can just let my guests pick their favorite flavor, pop them into the Keurig Special Edition Brewing System, and in just a few seconds, am able to serve them a perfect steaming mug of Starbucks coffee--without even leaving my own kitchen! As my friends arrived on Sunday, I told them to toss their coats on the bed, and let them pick their favorite flavor. 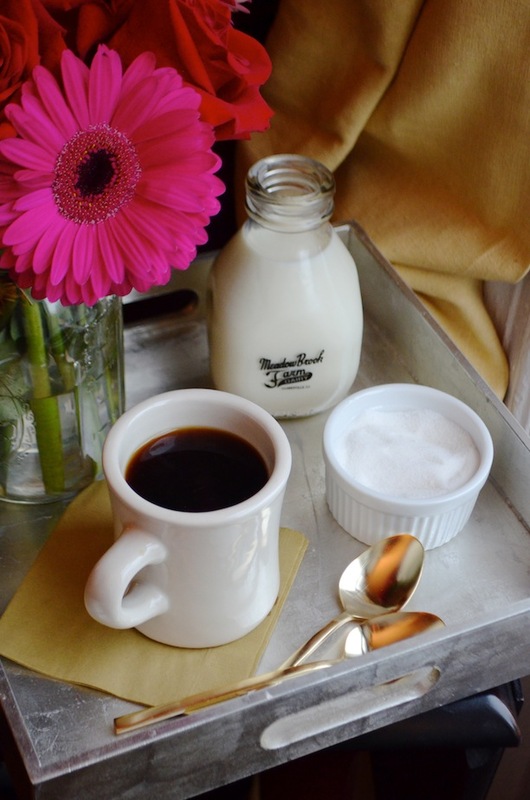 Once they had their coffee in hand, I sent them into the living room where I'd set out a pretty tray of cream, milk, and sugar so that they could prepare their coffee, just how they like it. When it comes to brunch, I like to keep decorations light and simple. 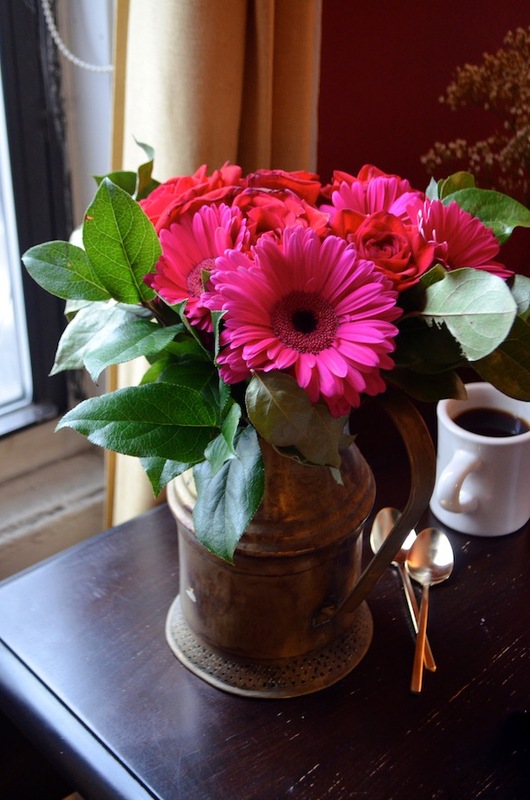 Flowers are one of my favorite touches (they're perfect for brunch) and so easy and inexpensive. We'd actually just celebrated our wedding anniversary a couple days before the brunch, and Eugene had given me a beautiful bouquet of roses that I decided to use for the party. I also ordered a dozen Gerbera daisies from the grocer, and then broke both bouquets down to make my own simple floral arrangements. Nothing like fresh flowers in unexpected corners. 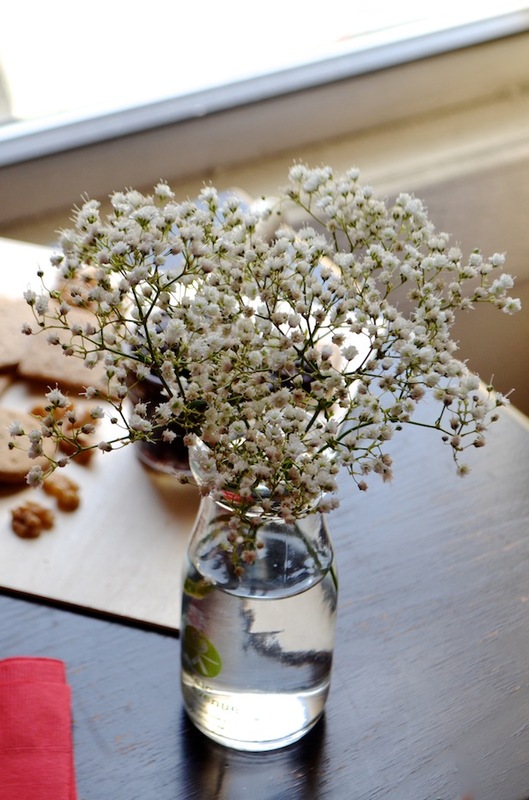 I think one of the best aromas is the smell of brewing coffee, and I wanted to enhance the great scents coming out of the kitchen by creating my own DIY Coffee Potpourri. 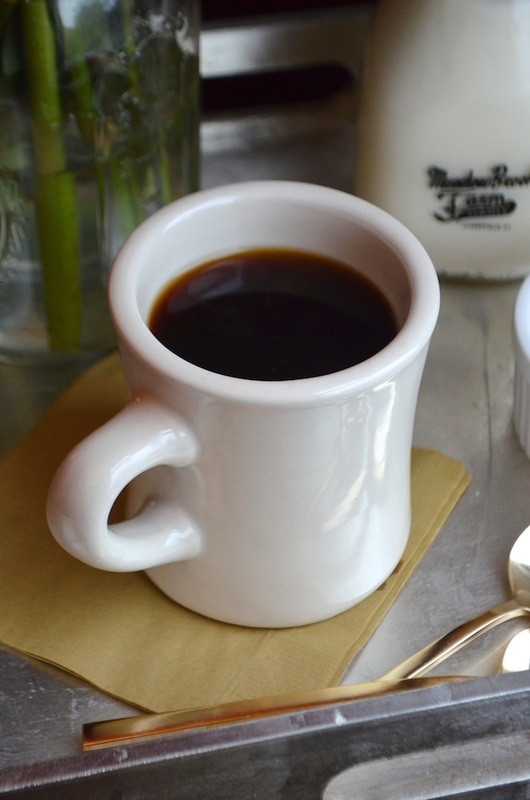 To make, simply fill a small decorative container with coffee beans (choose your favorite flavor--they all have different scents!) and nestle in a small votive. 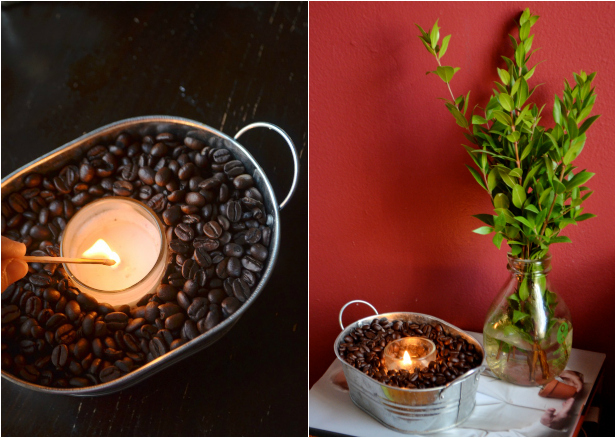 The warmth from the candle will spread the scent of coffee throughout your home, giving it that cozy, coffee shop feel. 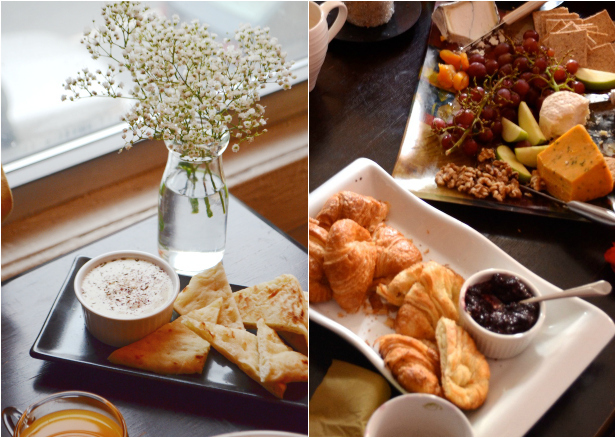 The beauty of brunch is that sweet and savory dishes are equally acceptable, so it gives you a lot of flexibility to play around with the menu and serve some of your favorite dishes. To start, I set out a cheese plate featuring three great cheese (Cotswold, Humboldt Fog, and Coupole), with some accompaniments--sweet red grapes, dried apricots, apple slices, walnuts, Irish brown bread crackers, and slices of fig & almond cake. I also put out a bowl of Spiced Feta Yogurt Dip with pita chips, and croissants and crackers with my homemade Mixed Berry Cocoa Jam. 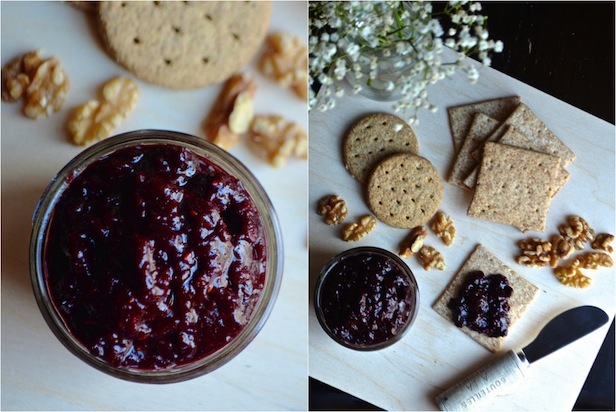 The jam is one of my new favorite recipes, and I was excited to share it with my guests. 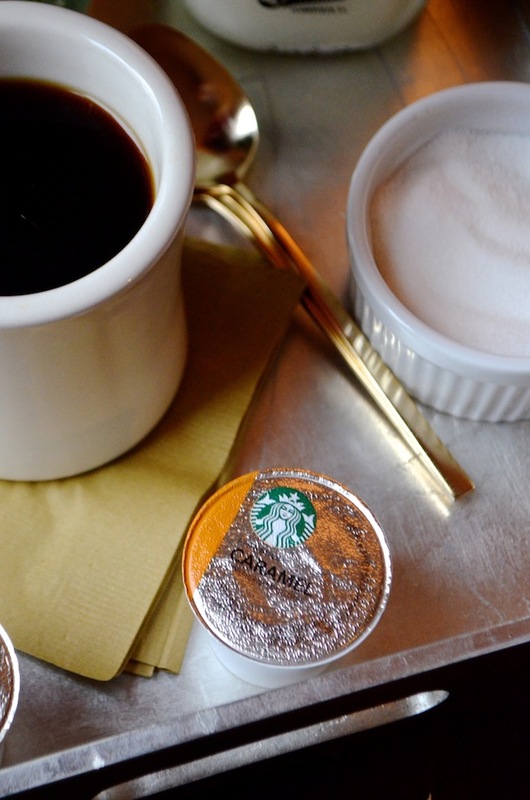 The flavors went particularly well with the Starbucks® Vanilla K-Cup® coffee. 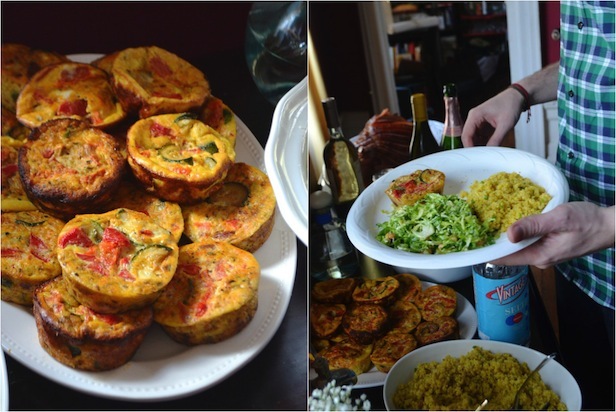 As the main course, I made Mini Chorizo & Zucchini Frittatas, which I baked in a muffin pan and served at room temperature. Mini frittatas are definitely the way to go when serving a crowd. They look cute, and are already perfectly portioned into individual servings so that people can just help themselves. I also baked a gorgeous spiral ham, that I topped with a simple Orange Honey Ham Glaze. The ham already comes fully cooked, so all you have to do is heat it through and pour on the glaze. It's one of my favorite things to serve when entertaining. For the sides, I made a couple of hearty winter salads. Eugene and I recently had dinner at an Italian restaurant here in the city called Barbuto, and I fell in love with their Brussels Sprouts Salad with Hazelnuts. I wanted to recreate it...so I did! 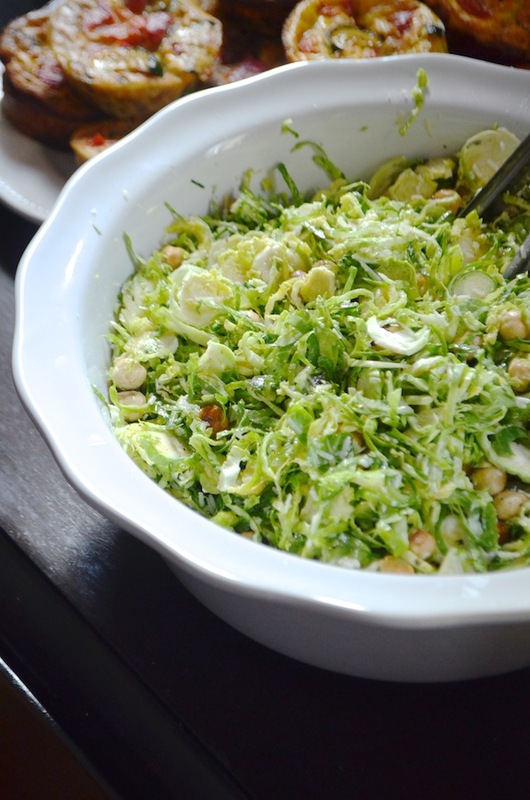 It's a beautiful combination of shaved raw Brussels sprouts, toasted hazelnuts, and grated Pecorino cheese in a simple lemon dressing. I balanced it out by adding a drizzle of orange blossom honey on top just before serving. I also made a simple Herbed Quinoa Salad with Turmeric, which added a lot of bright color to the table, and paired nicely with both the eggs and the ham. 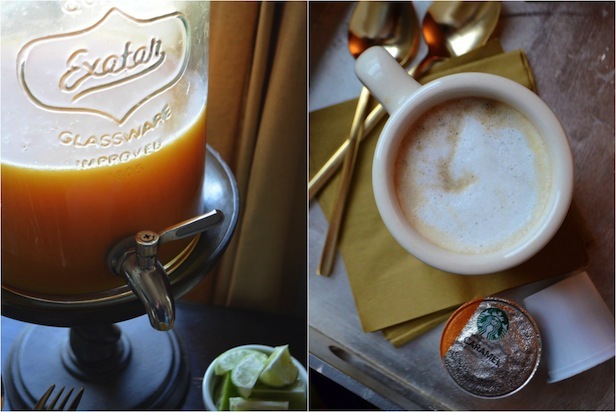 Along with the mugs of steaming Starbucks® K-Cup® coffee, I also served a mix of fresh citrus juices, by combining freshly squeezed orange, tangerine, grapefruit, and lemon juices. 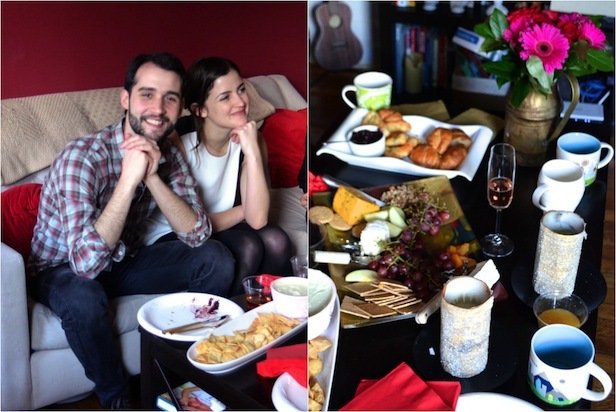 Some of the guests also brought bottles of chilled white and sparkling wines to share. As the afternoon wore on, I pulled out the cake I baked for dessert. 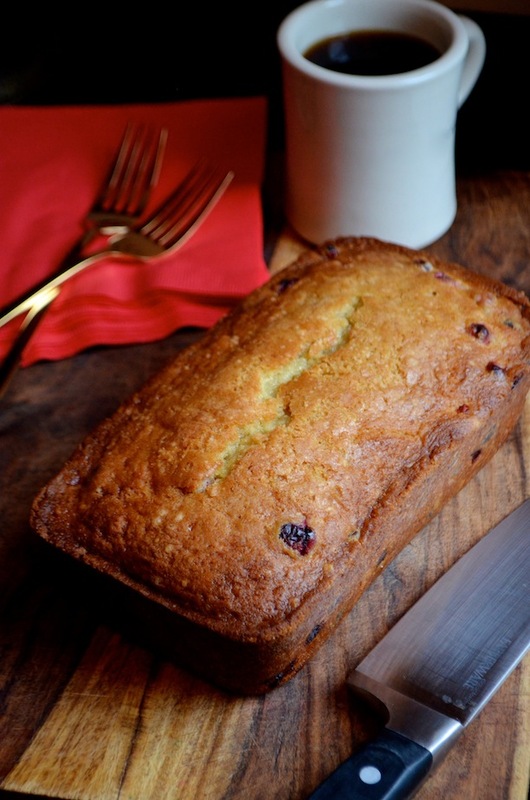 I wanted to celebrate the flavors of the winter season, so I made a Cranberry Orange Chocolate Chip Loaf Cake studded with fresh, tart cranberries, and dark chocolate chips. 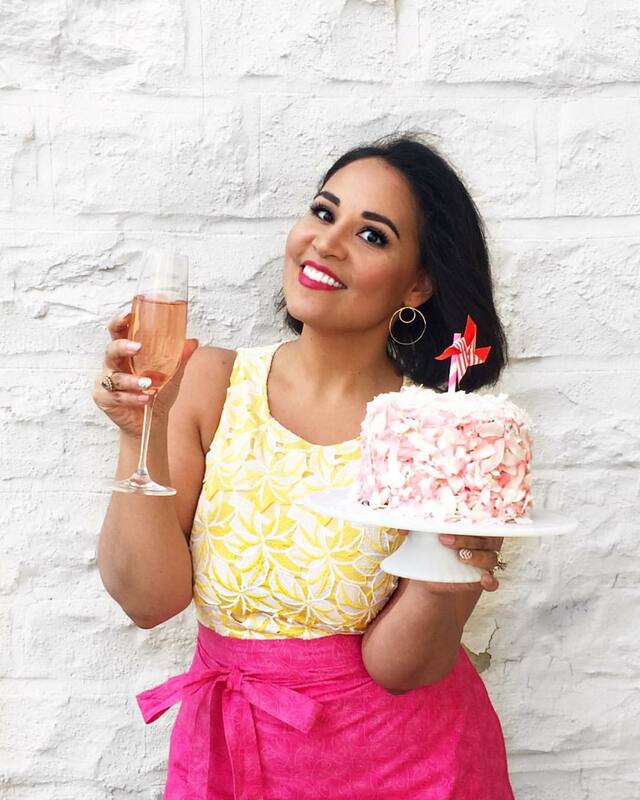 It's citrus season, so I scented the cake batter with rich vanilla extract and a flurry of fresh orange zest--a light and sweet combination that paired beautifully with the Starbucks® Vanilla K-Cup® flavor. It really was the perfect sweet ending to the day! DISCLAIMER: This post is sponsored by Starbucks K-Cup Packs. Thank you for supporting great companies like Starbucks that make it possible for me to keep creating fun new content for you to enjoy. All photos, opinions, and ideas are (of course!) my own.